OLD NOTEBOOKS: East Anglia: Aunt Liz was an unusual person because she didn’t speak much, lived like a recluse and it’s only recently I realized she may have been Bipolar – it was so long ago, nobody knew about it then. I was often away and when I came back, she wouldn’t speak to me. The neighbours would tell me she was sometimes socially active, then after a few days she’d go back to her silence and not speak to anyone at all for months. Aunt Liz lived in that house for 23 years. She was alone, preferred to be alone and at the age of 85, she died alone. Bottles of milk left on her doorstep for two days, the police forced the back door and found her sitting on the sofa. It was 1989, I was in Japan, didn’t know it had happened until a relative called me on the phone (no emails in those days) and in a screeching, long-distance voice told me about it; said she’d inherited Aunt Liz’s house and was going to sell it – or did I want to buy it? Yes I did, so we got the paperwork done, I had the contractor go in and do renovations, but it was more than a year by the time I got back to the house. Everything had changed of course, fresh paint, new plaster; the emptiness of a newly renovated house and nothing left to remind me of Aunt Liz. She was just not there any more – something about it strangely familiar; she was never ‘there’. So many times in the past I’d ring her bell, but no answer. Then I’d be in my house next door, listening for sounds, holding my breath and maybe I’d hear the clink of a cup or plate, and know she was there. Mostly she was simply a presence, so silent sometimes I’d forget about her completely. That time I came back from Japan, the first thing I did was look for something to use as a floor cushion and sit for a few minutes of meditation in the place where her sofa used to be. This is where she would read her newspaper, do her knitting, watch the six o’clock news … this is where she died. Maybe it was on a day like this; the quietness, the sound of the birds in the trees all around, an ordinary day, and she paused in a quiet moment and listened to the birds; the same birds I’m listening to now, some of them their descendants. Maybe she contemplated this sound as I’m doing now, and had the same awareness of the hearing mechanism that carries the sound. Get up and open all the windows, landscape reaching out to the horizon; hazy blue sky, the smell of the sea. The sound of birds enters the room, tiny fragments of a hundred melodies merged together in a flow of incidental harmony; no beginning, no middle, no end; blackbirds, thrushes, sparrows and in the quiet intervals, the distant mewing of gulls flying in from the sea. The second post on the house on a hill – click the link for the first post. 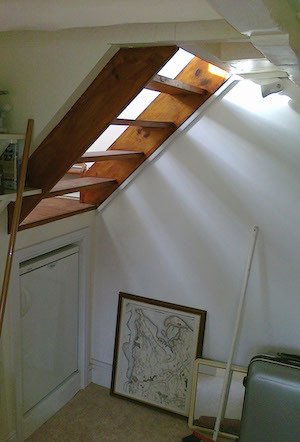 Photo shows the back staircase built during the renovation and a new window in the wall opposite so the light can enter the otherwise dark kitchen. Very beautiful reflections! Yes, may all beings be at ease! I found this very moving and hope you don’t mind my reblogging it. Thankyou for sharing. Everything arises and everything falls away….Namaste. a very moving and personal story…. May you find healing and ease through reflections and sharing T.
Thank the universe T … Being Scottish is not necessarily conducive to letting go and going with the flow. I see a fellow traveler on the path here. I like your style, sifting for gems in the mundane, savoring, transmitting the view. And we seem to be in the same geographic as well. We even have common topics. In the letting go, we often find ease. That has been my experience. It is as if in losing the attachment we gain a sense of life as it is or was. Enjoyed the post. Thank you. I love this story Tiramit, albeit tinged with a kind of sadness for your Aunt Liz. Whenever you write you have the ability to make me feel that I’m actually there – in this case smelling the new paint, listening to the birdsong. You take us with you as you relive past memories. I will always remember your wonderful post about the lamb being born. An aura of stillness emanates from this, reminding me also of the respect that always accompanies the essence of love. Reflecting on things that took place long ago… remembering a particular day or an event, there’s a pause and the moment is gently held. Yes, sadness over your aunt who does sound like possibly Bipolar. And, it is hard to part with things that have emotional meaning. I am trying to do a purge of our apartment, simplify things and reduce the amount of things. I imagine alone with a sense of loss and parting of another phase of your life, that you might feel relief as well, in simplifying your life. This urge to purge is driving me these days. We, like you, live in two places and that is complicated enough and perhaps needs changing. I don’t know. Attachments…. Thanks Ellen, also for your input on the Bipolar condition. I found your book in Amazon: Eye-locks and Other Fearsome Things, and now have it on my Kindle. You’re right of course, simplify things by seeing the attachments for what they are – to a greater or lesser degree, just knowing it’s like that. One thing I discovered is that it’s a relief to actually let go of things. The difficulty is in being able to de-clutter at will. I like your idea of the ‘urge to purge’, developing the motivation to just get on and do it… definitely a good thing to practice. Oh dear! Please be easy reading my book. It is all about attachment and mental illness. A stretch for your Scotts sensibility and Buddhist non- attachment. Not sure it will help you understand your aunt. I was seeking love, achieved my goal, found love. Now my goal to deal with that attachment, fear of loss of spouse. Anyhow many thanks for buying the book. Hope you will find it interesting. Thank you. Trying to leave a little note on two of your posts which did not seem to come through. Re: your book Might it be possible to have consecutive postcards and then, at the end, postscripts with the odd, non-fitting posts? It is overwhelming. But I think it will come off very well and be well received. The framed map, the suitcase, a broom, light filtering through a staircase. A home that says ‘journey’.